Mixed news on the injury front for manager Ger Cunningham. Dublin face Wexford in Croke Park on Saturday. 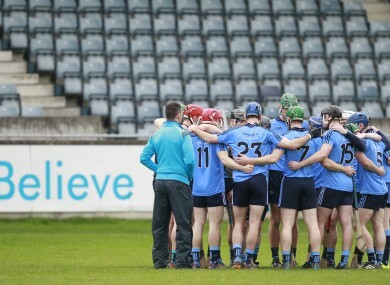 IT’S MIXED EMOTIONS on the injury front for Dublin hurling boss Ger Cunningham. On the one hand, he’s seen three players return to his squad in recent weeks – Paul Schutte, Ryan O’Dwyer and Niall Corcoran. But on the other hand, he will still be without seven players for next Saturday’s opening hurdle in Leinster against Wexford. Injuries will sideline Peter Kelly, Cian Boland, Cian and Riain McBride, Ben Quinn and James Madden while Colm Cronin is unavailable due to exams. “Ryan (O’Dwyer) has been back in, he played in the club championship,” said Cunningham. ‘Niall Corcoran, the same. Paul Schutte is back but unfortunately, he missed the second (club championship) game with concussion that he had from the first game with Cuala. The absence of Kelly will be keenly felt as he has been a defensive stalwart for this Dublin team in recent years. “It is frustrating,” admits Cunningham. “Last year, we played him centre-back at different stages. He’s a very versatile player. “But I suppose, if it’s frustrating for me, it’s obviously very frustrating for Peter as well. “He did him hamstring against Galway last year and missed a lot of the summer hurling last year. He went back with his club, got the knee problem and he’s been out since. Cunningham also understands the priorities of Cuala player Cronin at present. “Yeah, it’s just a seriously busy time for him. He’s in the middle of exams. Email “Dublin get 3 players back but still have 7 out for Leinster clash with Wexford”. Feedback on “Dublin get 3 players back but still have 7 out for Leinster clash with Wexford”.